Brilliant, brilliant, brilliant!! I’m sure many of you have had a similar type person in your life. However, since I’m not prone to violence (as much as sometimes I wish I were) and I really don’t want to end up in jail for smashing someone with a “hammah!”, I had to settle for making fudge. No, really. It helped a tremendously. Let me explain. 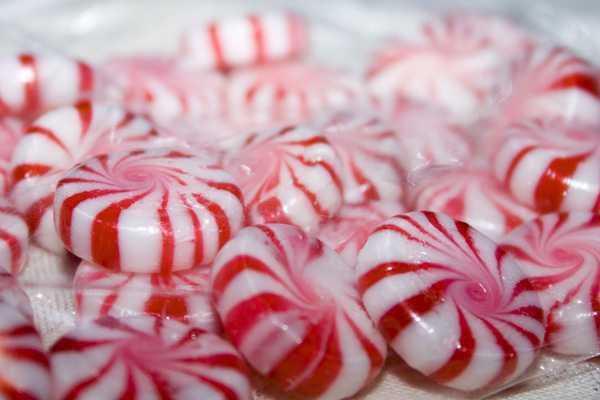 These may look like ordinary peppermints, but they are not. They are in fact more valuable than the best therapist around. At least they are when coupled with this. My trusty mallet, which for my purposes I shall imagine is a giant cartoon sized “hammah!”. I bashed the daylights out of these things. 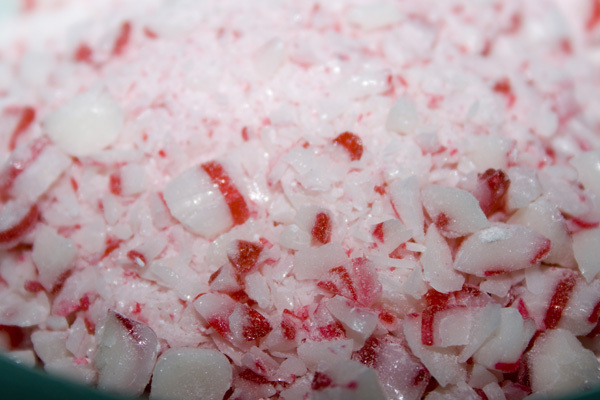 Imagined I was beating something other than peppermints & indulged in maniacal laughter the whole time. I feel right as rain. Sort of. (sigh) Maybe I should make a second batch? Aside from the obvious anger management benefits of this recipe, the fudge is truly delightful as well. The white chocolate and sour cream provide a welcome change-up from the typical chocolate version that’s everywhere during the holidays. I do have one question though. 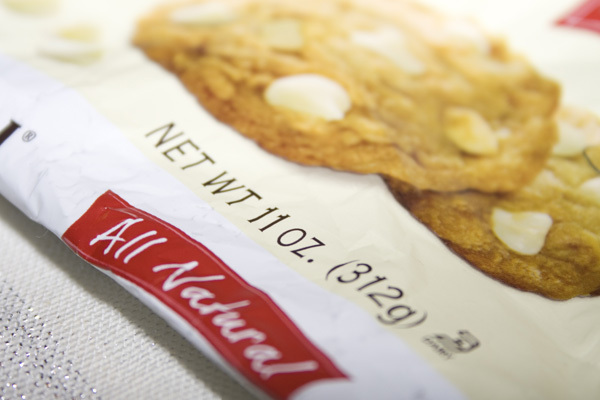 Since when is a bag of chocolate chips only 11 ounces, not 12? Cutbacks of this magnitude make me want to call my congressman. Something must be done!! 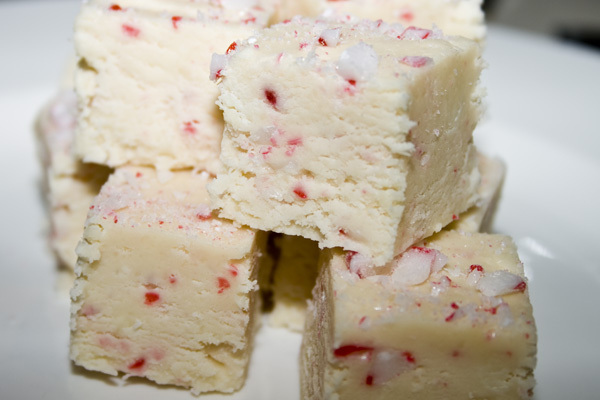 I highly recommend this fudge for getting out some pent-up aggression. It does double duty as a pretty special treat to take to neighbors, co-workers or to your next party. I love multi-tasking recipes. 1. Line a 9-in. square pan with foil. Grease the foil with 1-1/2 teaspoons butter; set aside. 2. In a large heavy saucepan, combine the sugar, sour cream and remaining butter. Cook and stir over medium heat until sugar is dissolved. Bring to a rapid boil; cook and stir until a candy thermometer reads 234° (soft-ball stage), about 5 minutes. 3. Remove from the heat; stir in marshmallow creme and white chocolate (slowly) until melted . 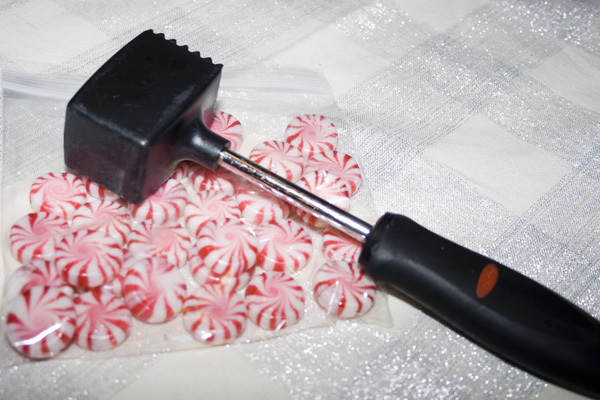 Fold in peppermint candy and extract. Pour into prepared pan. Chill until firm. 4. Using foil, lift fudge out of pan. Gently peel off foil; cut fudge into 1-in. squares. Store in the refrigerator. Yield: 2 pounds.